Shaban (right) tussling with KCCA’s Denis Okot last season at the GreenLight stadium. 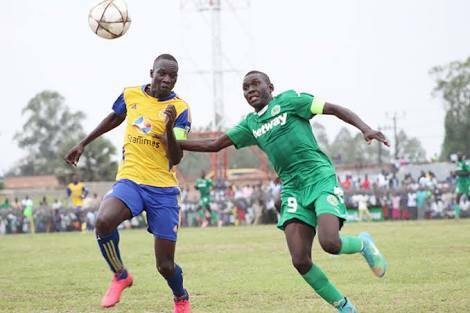 ARUA: Onduparaka FC will try to further put KCCA FC title charge in jeopardy as they host the two time league defending champions at the BetWay GreenLight stadium this Tuesday at 4:30pm. KCCA FC risk falling further behind in the title race after the 0-0 draw at Maroons in their last game saw them fall five points off the pace. The game will also be centred on the fact that former Onduparaka captain Shaban Muhammad will be facing his former side at the GreenLight stadium for the first time since his controversial move to KCCA at the start of this season. Onduparaka we’re levied by the manner of the transfer and tried to block it but in vein leaving many attached to the club furious at both KCCA and Shaban him self. Shaban Muhammad will return to his childhood club with another side for the very first time. “Its such a pity that we go into the game in terrible form as forwards but we have been working on our short comings lately and hopefully, this is the game we hit the ground running again. Asked about the prospect of facing his former side, Shaban had this to say. Of course it feels kind of weird because i have played for Onduparaka all my life but i don’t feel any additional pressure at all and i am ready to do my job as a KCCA player. Shaban has been out for a while but travelled with KCCA to Arua and he is highly expected to feature. Goalkeeper Tom Ikara also returned after almost two and a half months out. 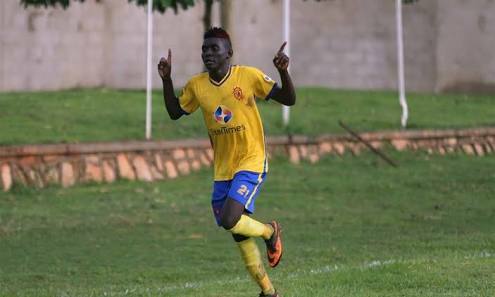 KCCA’s only absentees are defender Paul Musamali and midfielder Ibrahim Saddam Juma, both of whom still have long spells on the side lines. KCCA FC go into the game in second spot on the log, five points behind the leaders SC Villa whilst having a game in hand. For Onduparaka, they seat in fifth with 37 points from 24 matches played so far.This fixture has not seen a draw or an away win in any of the three games played between the two sides in the league. The reverse fixture last season ended 2-1 in the favour of the Catapillers with Shaban scoring one of the goals. The game between KCCA and Onduparaka has seen 15 goals scored in the three fixtures played in the top flight including five at the start of the season when KCCA won 4-1 at the StarTimes stadium. Onduparaka go into the fixture having not lost in any of their last four games(W2 D2). The Caterpillars have not conceded a single goal in that period whilst scoring a goal per game on average. KCCA have not lost any of their last 10 league games (W6 D4) while Onduparaka have won, draw and lost three apiece in their last nine in the same period. The Arua based side has tested defeat at home only once ever since they joined the top tier. That loss came at the hands of leaders SC Villa last month, they have played 26 home league games in that period. KCCA FC have not been in the best of form away from home this season, winning only three of the 10 games on their travels(D5 L2).